February 21, 2012 – WASHINGTON, D.C. – The U.S. Consumer Product Safety Commission, in cooperation with the firm named below, today announced a voluntary recall of the following consumer product. Consumers should stop using recalled products immediately unless otherwise instructed. It is illegal to resell or attempt to resell a recalled consumer product. Hazard: The bicycle's frame can break in the center of the downtube during use, causing the rider to lose control and fall. Incidents/Injuries: The company is aware of 12 reports of bicycle frames breaking, including two injuries, a head laceration requiring 20 stitches and scrapes and bruises. Description: The recalled bicycles are Fuji women's cruiser bicycles. The 2008 through 2010 models Saratoga 1.0, Saratoga 2.0, Saratoga 3.0 and Saratoga 4.0 are included. The bicycles are various colors. “Fuji” and “Saratoga” alone or “Saratoga” along with the model number is printed on the frame of the bicycle. Serial numbers beginning with ICFJ7, ICFJ8, ICFJ9, ICFJ10 and ICFJ11 are included in this recall. The serial number is located on the bottom of the frame near the crank. 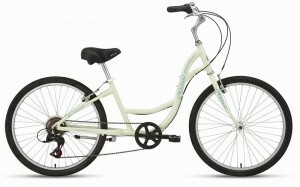 Sold by: Specialty bicycle stores nationwide from November 2007 through December 2011 for between $300 and $500. Remedy: Consumers should stop riding the recalled bicycle immediately and return it to any authorized Fuji Bicycle dealers for a free replacement frame.